Zeehan /ˈziːən/ is a town on the west coast of Tasmania, Australia 139 kilometres (86 mi) south-west of Burnie. 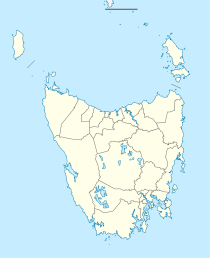 It is located north of Strahan, Tasmania and Queenstown, Tasmania. In the early 1900s it had its own council. It is currently part of the Municipality of West Coast. The town was named after the nearby Mount Zeehan which had been named by George Bass and Matthew Flinders after Abel Tasman's Fluyt Zeehaen. The region has one of the oldest settler histories of any part of Tasmania, when Abel Tasman sighted this part of the state in 1642. An early port for Zeehan was Trial Harbour but it was very precarious in its location on Ocean Beach and was overtaken by Strahan. Zeehan was established as a mining field, then as a town after the Zeehan-Dundas silver-lead deposits were found in 1882 by Frank Long. Mount Zeehan Post Office opened on 1 August 1888 and was renamed Zeehan in 1890. The peak period for mining was up to the First World War, though lead mining continued on up to 1963 at mines such as the Montana and Oceana. The population of Zeehan-Dundas peaked at 10,000 about 1910, over ten times the current population. It was clearly in competition with the town further south, Queenstown, and while the silver boom lasted it was known as the Silver City. In the first decade of the twentieth century it was on a par with Launceston and Hobart for size. With a main street over two miles long (3.2 km); it also claimed over 20 hotels. In the 1970s it saw increased activity due to operations at the nearby Renison Bell Tin mine, and again in the 1990s. At the 2011 census, Zeehan had a population of 728. Zeehan is connected with the north coast of Tasmania by the Murchison Highway, to Strahan by the Zeehan-Strahan Road, and Queenstown by the Zeehan Highway. Zeehan was an important railway location—the end of the Emu Bay Railway, and the beginning of the government-owned Strahan-Zeehan Railway service that connected to Strahan and Regatta Point, where the Mount Lyell Railway connected to Queenstown. Also at early stages of the town's history, a series of timber trams spread out from Zeehan towards the Pieman River as well as a number of other locations. Some of the smaller railway operations east of Zeehan were unique. One had the honour of having the first Garratt steam engine designed and built for its operations. After the government rail connection between Zeehan and Strahan closed, the Mount Lyell Company trucked its copper ore to the Emu Bay Railway terminus at Melba Flats, a few kilometres east of Zeehan. MMG Limited Avebury nickel mine, Zeehan Zinc's Comstock Mine and the Bluestone Tin's Renison Bell tin mine are significant economic contributors to the community, but the majority of the town relies on tourism for its survival. Among these attractions is the West Coast Heritage Centre which was formerly known as the West Coast Pioneers Museum, which is in the old School of Mines building. The main streetscape of Zeehan is one significant feature of the town. The famed concert pianist Eileen Joyce was born in Zeehan, and Eileen Joyce Memorial Park in Zeehan was named in her honour. Parts of a 1925 Australian silent film, Jewelled Nights were shot on Savage River, north of the town in the Tarkine rainforest. Bushfires were reported near Zeehan in 1896, 1908, 1977, 1980 and 2006. In November 2012 the town was threatened by bushfires from two directions. However, the alert was later removed. There were also bushfires in February 1890 (diary of Edward Jennings and this http://nla.gov.au/nla.news-article13761103). ^ a b Australian Bureau of Statistics (31 October 2012). "Zeehan (SSC) (State Suburb)". 2011 Census QuickStats. Retrieved 2012-11-13. ^ Bureau of Meteorology. Retrieved on 2007-11-17. ^ "Zeehan Council". The North Western Advocate and the Emu Bay Times. Tasmania, Australia. 14 May 1909. p. 4. Retrieved 12 May 2016 – via National Library of Australia. ^ "MINERAL RETURNS". The Examiner (Tasmania). LX, (79). Tasmania, Australia. 2 April 1900. p. 2 (DAILY.). Retrieved 5 November 2016 – via National Library of Australia. ^ "MMG Limited | Avebury". Archived from the original on 2015-04-09. Retrieved 30 January 2016. ^ "Silent movie finds new voice". ABC News. Retrieved 30 January 2016. ^ "Two bushfires threaten Tasmanian town". ABC News. Retrieved 30 January 2016. ^ "TFS Map". Tasmania Fire Service. Retrieved 30 January 2016. Manny, L.B. (1963) Railways of the Zeehan District Australian Railway Historical Society Bulletin, October/November. This page was last edited on 17 January 2019, at 03:47 (UTC).